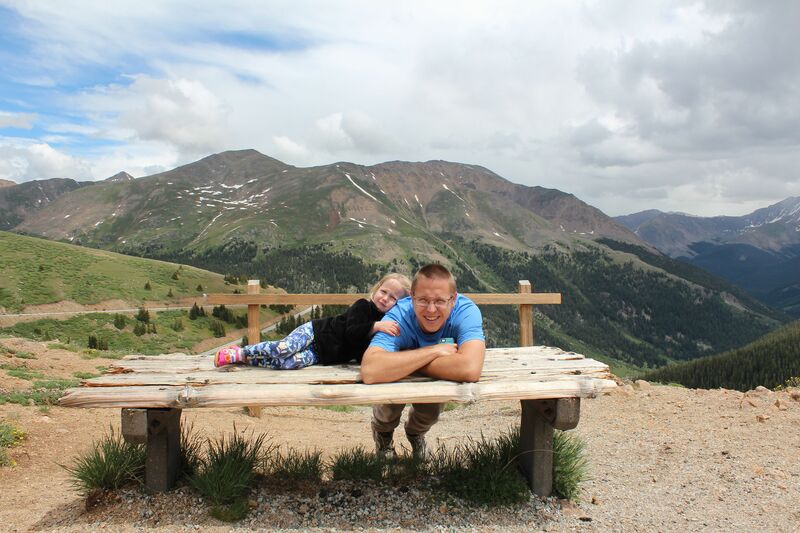 I’ve been really craving a good old-fashioned road trip this summer, not to mention wanting to get out into Colorado a little bit more and see parts of the state I’ve always wanted to see, so we decided to do a little mini road trip this week. Originally, we were going to make it a day longer and camp one night, but the forecast was calling for rain and temps in the 40s, so we decided to not be miserable and just drove through that section. It added more driving time, but ended up being a really great choice. 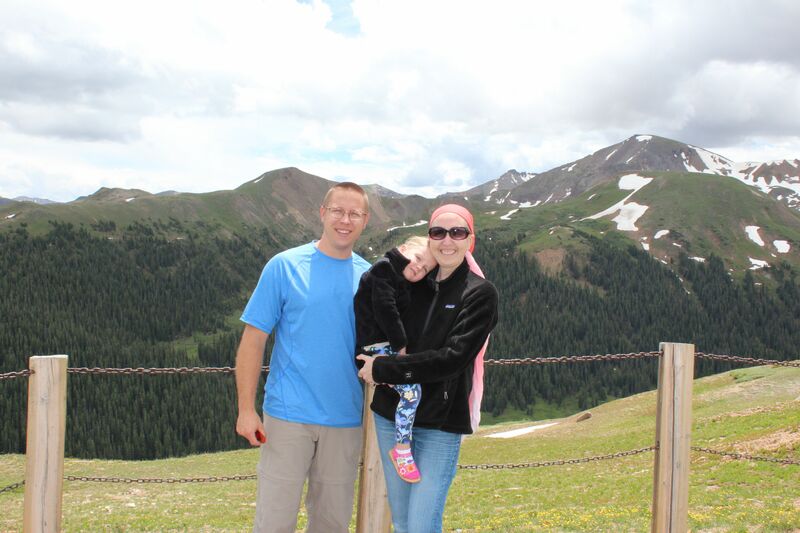 One of the things we did was drive over Independence Pass, which I think I had vaguely heard of, but never knew how gorgeous it would be. There was a nice bit of paved trail around the pass, with incredible views of the mountains all over. It’s apparently the highest paved road over the Continental Divide, and has great views of the highest mountain in Colorado, Mt. Elbert (I’m sure we saw it, but sadly didn’t know exactly which huge mountain it was). There were lovely wildflowers all over as well, thanks to all the rain we’ve been getting. 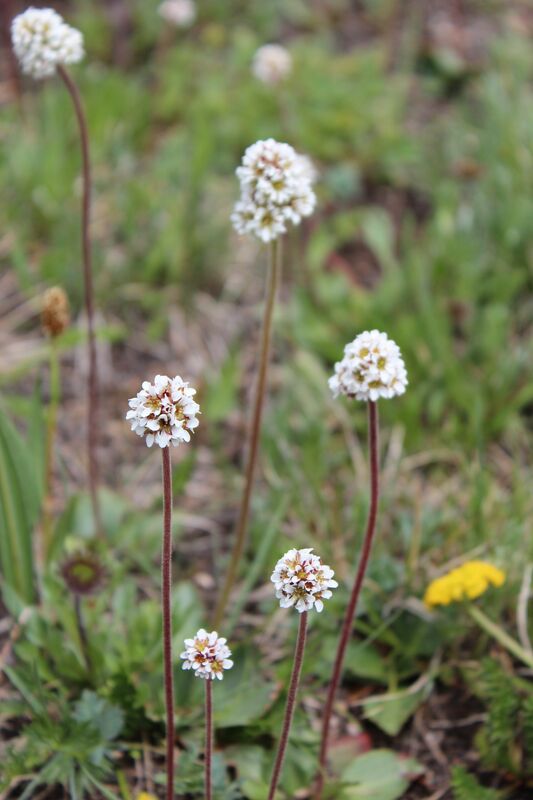 One of the nice things about the high tundra is that things are usually a month or more behind the lower elevations, which means you get to see beautiful flowers for longer than in the valley, where things can get hot and dry quickly. 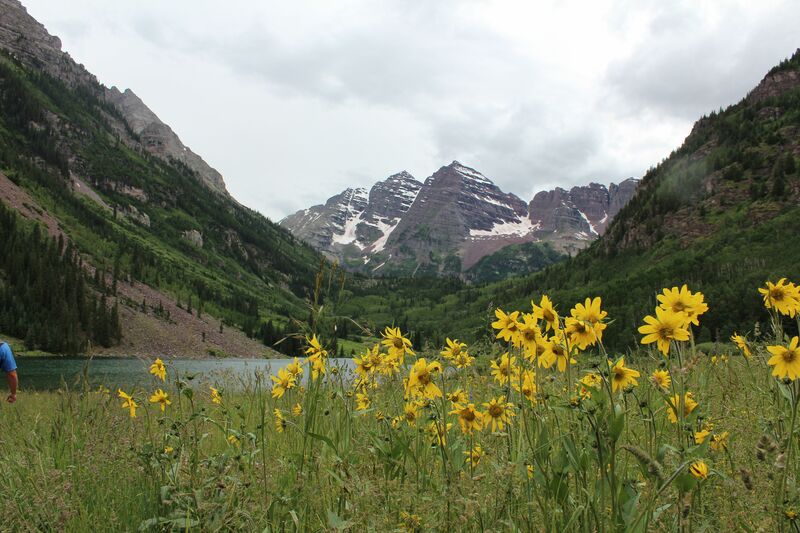 After Independence Pass, we drove to Aspen to see the Maroon Bells. This is probably one of the most photographed places in the world; the kind of place that once you see it and know it, you’ll start to see it everywhere. Due to our driving time, the time it took to park, and the time it took to take the shuttle to the Bells, we ended up only having about 45 minutes actually at the Bells (it took probably 2-3x as long to get there, thanks to some poor planning and reading comprehension fails on my part). Even though we only had a short time, we still had a lovely time. Even though the light was fading and rain was threatening, it was still gorgeous. Emmie and I took a tiny hike to see the beaver house while Peter did some fishing. He finally caught a beautiful little brook trout with impeccable timing because as soon as I snapped a few shots of it, it was time for us to leave to catch the very last bus out. We had been warned by literally every person we talked to not to miss the bus because it would be a long 9-mile walk out without it (eek!). As it was, we caught the bus with a few minutes to spare (after some very quick walk/running and some panicking by sweet Emmie), but then we ended up waiting 15-20 more minutes for some alleged moms with strollers who never did appear (I truly hope they caught an earlier bus or at least were excited about a long walk back). We made it back to Aspen just in time to run through a driving rain to our car. We drove the hour up to Glenwood Springs and checked into our great hotel, the Best Western Antlers. It turned out to be perfect for us. Good price, has its own pool, hot tub, and best of all, its own playground! Emmie and I played on the playground for a good hour while Peter rested, then we all walked across the street to a restaurant a friend recommended, The Pullman. Holy cow, was it ever good! We ordered a salad, an appetizer, entrees for each of us, a kid’s meal for Emmie, and a dessert. Think we were hungry? Haha! Everything except my entrée was amazing (my entrée was fine, just not as incredible as the rest of it). It was probably one of the best meals I’ve had in quite some time. Bellies very happily filled, we walked back to our hotel, crossing the bridge over the famous hot springs, and we stopped for a moment to watch the kids doing flips off the diving board in the warm night into the beautifully lit pool. It was amazing how many people were still swimming after 9 PM, many of them children. It was a perfect summer night. In the morning, we had a great continental breakfast in the hotel lobby (free! yay!) with fresh waffles, yogurt, bagels, oatmeal, and hot chocolate. Mostly carb-based, but still very good for a hotel continental breakfast! All fueled up, we checked out of the hotel and headed for the Hanging Lake trailhead. 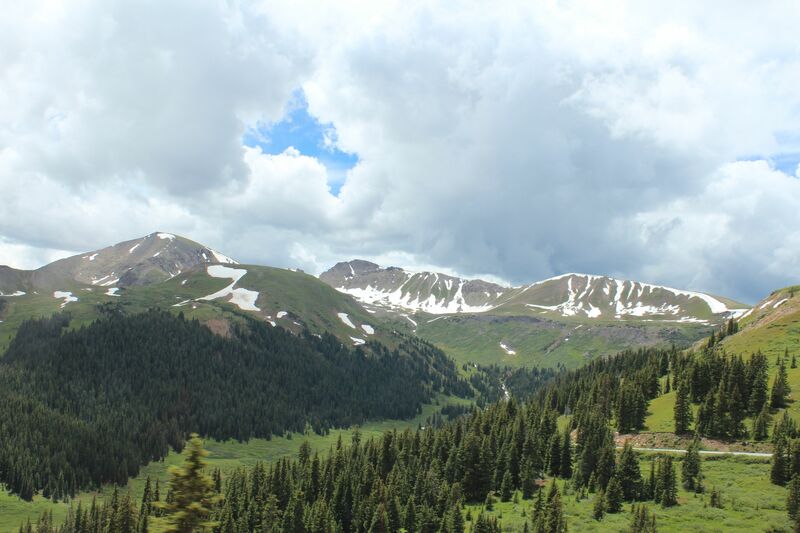 Since this is one of, if not THE most popular hikes in Colorado, there is a lot of information available online about the trail. It seemed like most of the information was intended to scare/warn people about: 1) the parking ; and 2) the strenuousness of the hike. We decided not to kill ourselves trying to get there crazy early (some placed said that the parking lot fills up as early as 8:30 AM). We got there just before 9 and managed to snag the very last spot in the lot! Once we had that, I felt a LOT better. The hike itself was not crazy easy, but definitely not super hard. It was about 1 mile with 1,000 foot elevation gain. The entire thing followed the most beautiful stream, with countless waterfalls, 7 bridges, and tons of shade the whole way (awesome!). The best part? Emmie walked the ENTIRE WAY UP, ALL BY HERSELF! There were some serious steps for those little legs, but she did great. Even though the hike itself was gorgeous, the reward at the top was absolutely incredible. 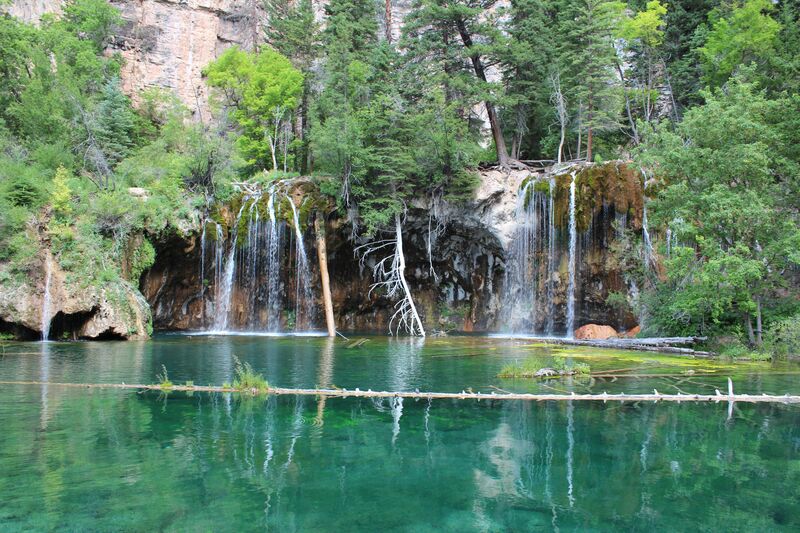 Hanging Lake was gorgeous. It literally is just hanging on a cliff, practically, and the color of the water is incredible. There are brook trout in the lake (no fishing), and the water is so clear you can see their every move. The waterfalls into the lake are stunning, and everything is just so gorgeous. There are boardwalks around the lake, with benches to sit on and enjoy the beauty. There were a lot of people, so this is not the hike for you if you go into nature for solitude, haha. 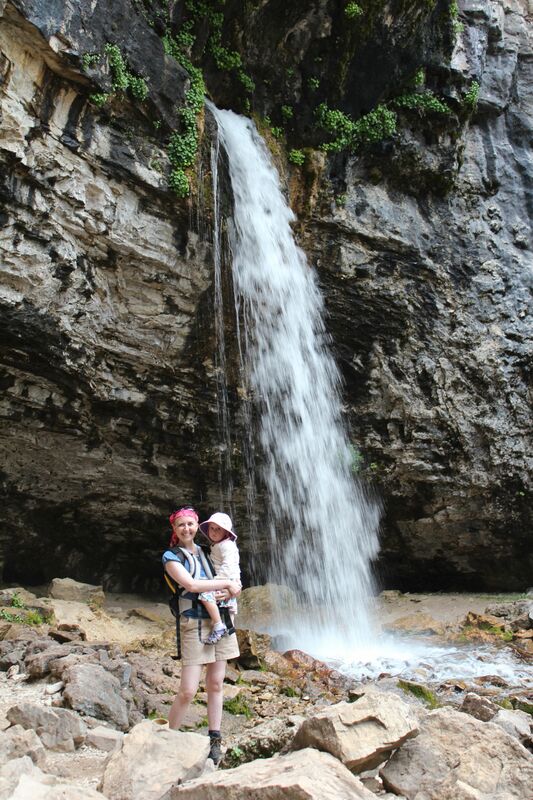 Above Hanging Lake is a lovely little spur to Spouting Rock, where a waterfall comes right out of a cliff wall. So cool! 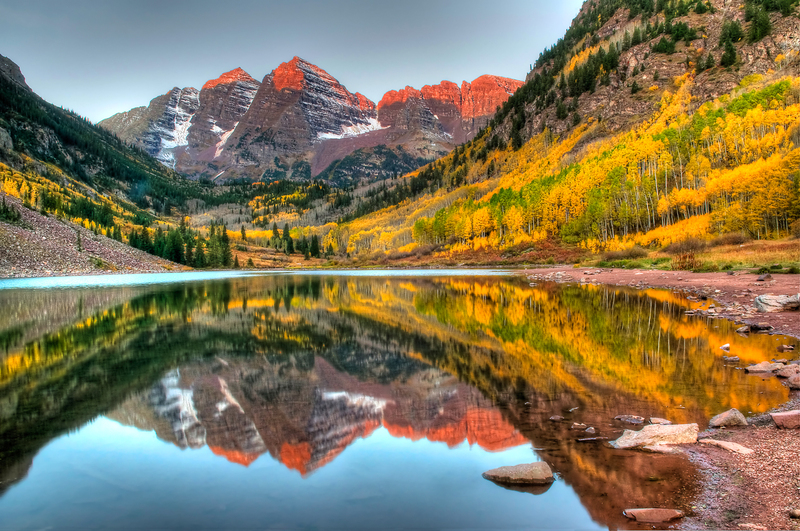 If you do this hike, you absolutely have to check it out. 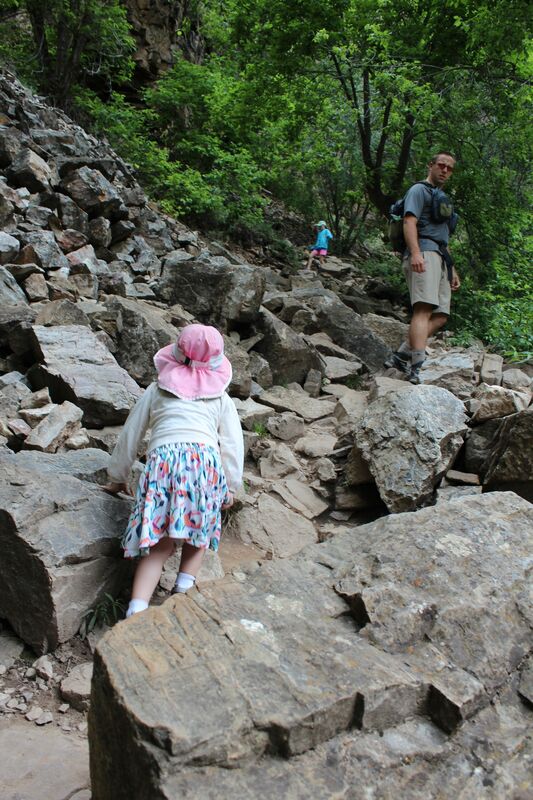 The hike down was a little trickier for Emmie, mainly due to balance. Rain clouds were coming in quickly, so Peter put Emmie on his back using our awesome Tula toddler carrier. Once we did that, we were able to make great time back down and hardly got rained on at all. Overall, the whole hike took us about 3 hours-ish, with a semi-leisurely pace (preschooler legs) on the way up and crazy hiker-man pace on the way down. 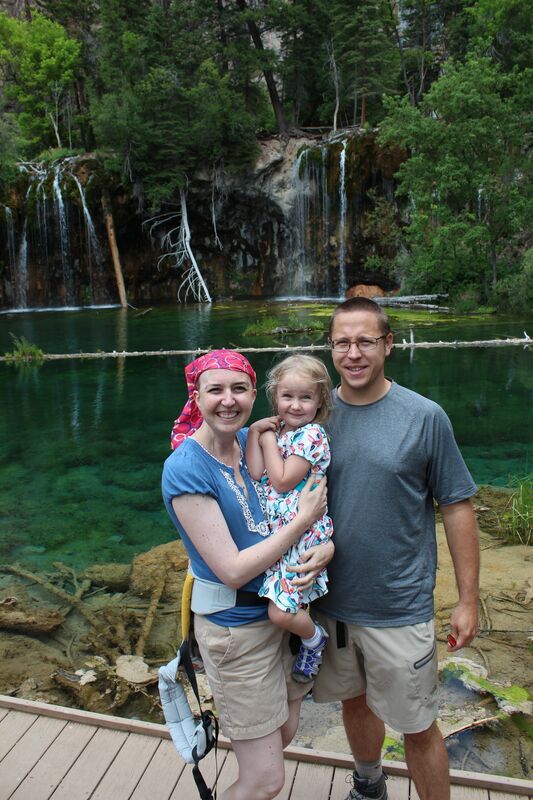 We drove back down the mountains after grabbing some lunch back in Glenwood Springs (there is no way to get back on eastbound I-70 from the Hanging Lake exit, so you basically have to go back to town, just to turn around and head in the right direction). Emmie was so tired after her big adventure that she fell asleep in the car for most of the drive, but not before asking multiple times if we could come back and do it again. I think that’s a sure sign of success! What summer adventures do you have planned? Who is planning on trying something they’ve never done before? 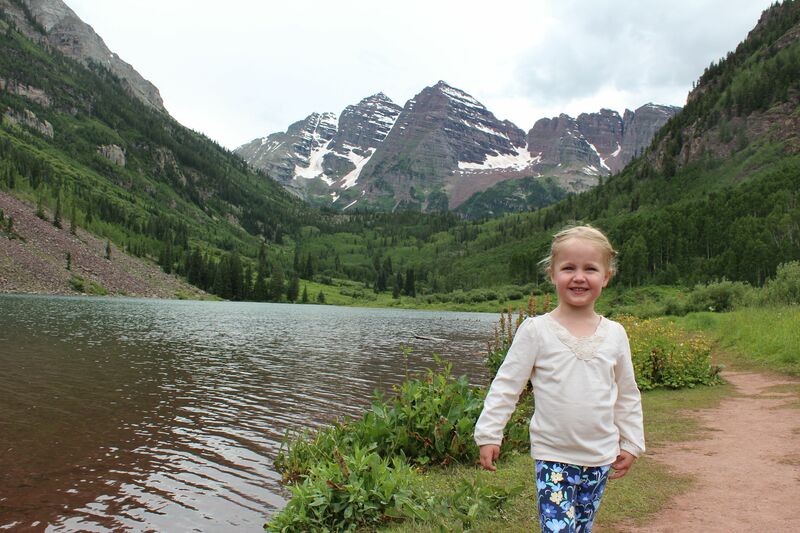 Maybe you’ll discover you love it as much as Emmie now loves hiking! You guys to tooo cute!! I love reading your adventures! What wonderful memories! I DO have something new this summer. I invested in a camera and gorgeous lenses and I’ve started learning photography from some professionals here. Very exciting. I enjoyed looking at the beautiful pics in your post too! And the ones of you guys = a gazillion adorbs!!!! 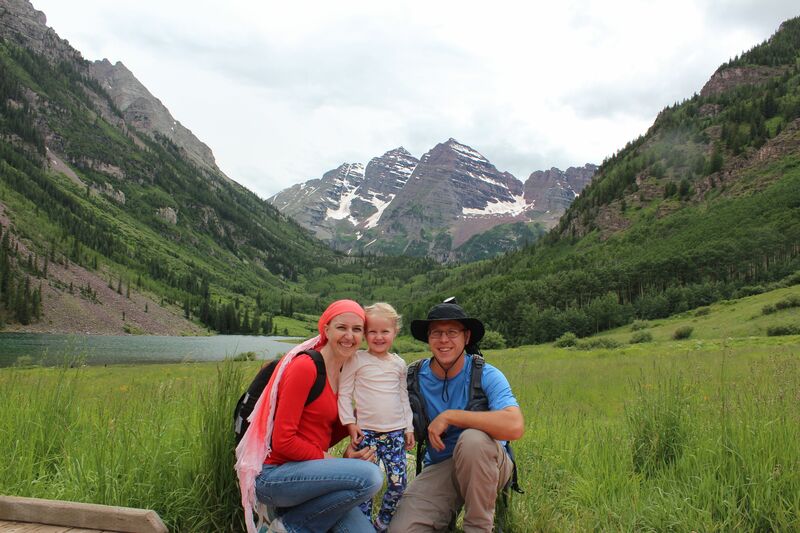 As always, your life and adventure writing is grand and we so enjoy reading all about it! !